This article is about the unit of mass used for gemstones and pearls. For the purity scale used for gold, see Carat (purity). The carat (ct) is a unit of mass equal to 200 mg (0.2 g; 0.007055 oz) and is used for measuring gemstones and pearls. The current definition, sometimes known as the metric carat, was adopted in 1907 at the Fourth General Conference on Weights and Measures, and soon afterwards in many countries around the world. The carat is divisible into one hundred points of two milligrams each. Other subdivisions, and slightly different mass values, have been used in the past in different locations. The ANSI X.12 EDI standard abbreviation for the carat is CD. First attested in English in the mid-15th century, the word carat comes from Italian carato, which comes from Arabic qīrāṭ قيراط, in turn borrowed from Greek kerátion κεράτιον 'carob seed', a diminutive of keras 'horn'. It was a unit of weight though it was not likely used to measure gold in classical times. It is commonly believed that carob seeds were used because their mass does not vary much. But in fact, they vary about as much as seeds of other species. In the past, each country had its own carat. It was often used for weighing gold. Starting in the 1570s, it was used to measure weights of diamonds. In the United Kingdom the original Board of Trade carat was exactly 3 1647⁄9691 grains (~3.170 gr); in 1888, the Board of Trade carat was changed to exactly 3 17⁄101 grains (~3.168 gr). Despite its being a non-metric unit, a number of metric countries have used this unit for its limited range of application. The Board of Trade carat was divisible into four diamond grains, but measurements were typically made in multiples of 1⁄64 carat. 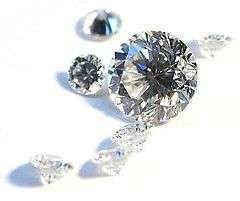 There were also two varieties of refiners' carats once used in the United Kingdom — the pound carat and the ounce carat. The pound troy was divisible into 24 pound carats of 240 grains troy each; the pound carat was divisible into four pound grains of 60 grains troy each; and the pound grain was divisible into four pound quarters of 15 grains troy each. Likewise, the ounce troy was divisible into 24 ounce carats of 20 grains troy each; the ounce carat was divisible into four ounce grains of 5 grains troy each; and the ounce grain was divisible into four ounce quarters of 1 1⁄4 grains troy each. The solidus was also a Roman weight unit. There is literary evidence that the weight of 72 coins of the type called solidus was exactly 1 Roman pound, and that the weight of 1 solidus was 24 siliquae. The weight of a Roman pound is generally believed to have been 327.45 g or possibly up to 5 g less. Therefore, the metric equivalent of 1 siliqua was approximately 189 mg. The Greeks had a similar unit of the same value. Gold fineness in carats comes from carats and grains of gold in a solidus of coin. One solidus = 24 carats, 1 carat = 4 grains, is preserved right up to this day. Woolhouse's Measures, Weights and Moneys of all Nations gives gold fineness in carats of 4 grains, and silver in pounds of 12 troy ounces of 20 pennyweight each. ↑ American Association for the Advancement of Science (1908). Science. American Association for the Advancement of Science. p. 144. Retrieved 30 June 2012. ↑ The United States adopted the metric carat definition on July 1, 1913, the United Kingdom on 1 April 1914. ↑ American Heritage Dictionary of the English Language. Houghton Mifflin Harcourt. 2013. ↑ State of Connecticut, Dept. of Admin. Services Archived April 17, 2012, at the Wayback Machine. 1 2 3 Harper, Douglas. "carat". Online Etymology Dictionary. ↑ Zhengzhang, Tao (July 1991). "On the origin of the carat as the unit of weight for gemstones". Chinese Journal of Geochemistry. Science in China Press. 10 (3): 288–293. doi:10.1007/BF02843332. ISSN 1993-0364. ↑ The pre-1888 Board of Trade carat, of which there were exactly 151 27⁄64 per ounce troy, was approximately 205.4094 mg.
↑ The post-1887 Board of Trade carat, of which there were exactly 151 1⁄2; per ounce troy, was approximately 205.3035 mg.
↑ Unlike the modern carat, the Board of Trade carat was not used for measuring pearls; those were measured with pearl grains. ↑ The refiners’ carats were the offspring of the carat as a measure of fineness for gold. ↑ Chaffers, William. 1883. Hall Marks on Gold and Silver Plate. 6th edition. London: Bickers & Son. ↑ Grierson, Philip (1960). "The Monetary Reforms of'Abd Al-Malik". Journal of the Economic and Social History of the Orient. 3 (3): 241–264. doi:10.1163/156852060X00098.